Cancer researchers at the University of Bath have measured systematically how efficient molecules are at suppressing the activity of a protein associated with prostate and other cancers. The molecules could eventually be developed into new anti-cancer drugs. The research team from the Departments of Pharmacy & Pharmacology and Chemistry are studying a protein called α-methylacyl-CoA racemase (AMACR) as a potential target for cancer treatments. Levels of AMACR protein and activity are increased by ~10-fold in all prostate cancers. Reducing these levels using genetic techniques makes the cancer cells less aggressive, and their behaviour becomes more like normal cells. Until relatively recently finding molecules that could target and inhibit AMACR has been challenging because it's been difficult to accurately measure activity levels of the protein. However, after designing a simple colour-change test which can do precisely that, the University of Bath team were able to start analysing how the structure of promising molecules affects the activity of AMACR. The team systematically varied the design of drug molecules in order to identify which parts of the molecule are important for effectiveness against AMACR. In particular they confirmed that the 'oiliness' of a molecule is directly related to its potency—oily regions of the drug molecule, which exclude water, can stick to their targets more easily—although this had been predicted, the University of Bath experiments confirm it for the first time. The information from the tests will help the team move towards more promising anti-cancer drugs. Their next steps will be to use the information to design rationally even more potent molecules for testing against AMACR. The research is published in the journal Bioorganic Chemistry. Lead author Dr. Matthew Lloyd said: "This is a small but important step in the development of new treatments for prostate cancer based on AMACR inhibition. It's important because it provides a framework with which to predict and measure drug effectiveness. This will facilitate the development of new treatments for prostate cancer and other cancers in which AMACR levels are increased. "The test that we've developed at Bath makes this sort of work possible and will now allow us to continue to work towards new anti-cancer drugs." 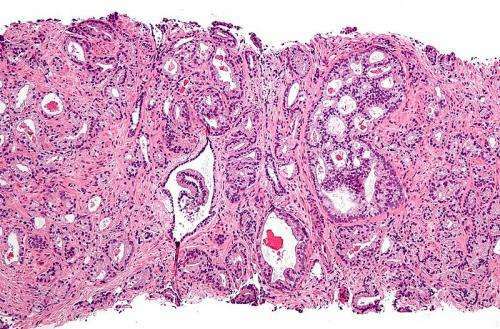 The study was funded by Prostate Cancer UK with support from the Movember Foundation as part of their initiative to develop new treatments for prostate cancer. Dr. Matthew Hobbs, Deputy Director of Research at Prostate Cancer UK, said: "Over 11,000 men die from prostate cancer every year in the UK, making it the third biggest cancer killer. In these men prostate cancer cells grow and evolve and eventually become resistant to the treatments currently available to combat the disease. However, important research like this which seeks to find new, innovative ways to treat prostate cancer has the potential to stop this trend. "It's thanks to the funds raised by supporters of Prostate Cancer UK and the Movember Foundation that this research is possible." In the United Kingdom, prostate cancer is the most common male-specific cancer with 47,151 new diagnoses reported in 2015 and 11,287 deaths in 2014. It accounts for 26% of all cancers diagnosed in men, with one in eight men being diagnosed with prostate cancer in their lifetime. Although 84% of men will survive for at least 10 years with the disease, new treatments are urgently needed especially for those men diagnosed with more advanced disease. The paper "Structure-activity relationships of rationally designed AMACR 1A inhibitors" is available online.